Neurocisticercosis is a disease of the central nervous system ( CNS) caused by the cestode taenia solium. The first human cases of NCC were described during the 16th century. Knowledge of the life cycle of taenia solium was completed during the second half of the 19th century by experiments demonstrating than when taenia eggs obtained from proglottids passed by infected humans were fed to pigs, the animals develop cysticercosis. NCC has a long asymptomatic phase correlated with an absence of brain inflammation due to a mechanism of immune suppression that is actually poorly understood. NCC may present with a variety of clinical manifestation, a pleiomorphism that is related to individual differences in the number and locations of the lesions within the CNS and to variations in the severity of disease activity. Until the introduction of the complement fixation test the diagnosis of CC only was made with the histologic demonstration of the parasite. Thereafter the introduction of TC and MRI allowed the visualization of intracranial cysticerci and improved the diagnosis on NCC. Cysticercosis is endemic in most of the developing world. While the exact prevalence of NCC is largely unknown. Population based the studies carried out in rural villages of endemic countries have shown that NCC is the principal cause of the excess fraction of epilepsy seen in these areas, when compared to the prevalence of epilepsy in the developed countries. The disease is also an health problem in urban centers of developing countries where NCC is still a major cause of hospital admissions to neurologic centers. NCC was rare in the USA and EUROPE up to 30 years ago. Together with the growing number of immigrants from endemic areas, there has been an increase in the number of patients with NCC in these countries. The tapeworm T.solium has a complex life cycle involving two hosts, humans and pigs. Humans are the only definitive hosts for the adult cestode, wherease both pigs and humans may act as intermediate hosts for the larval form called cysticercus. 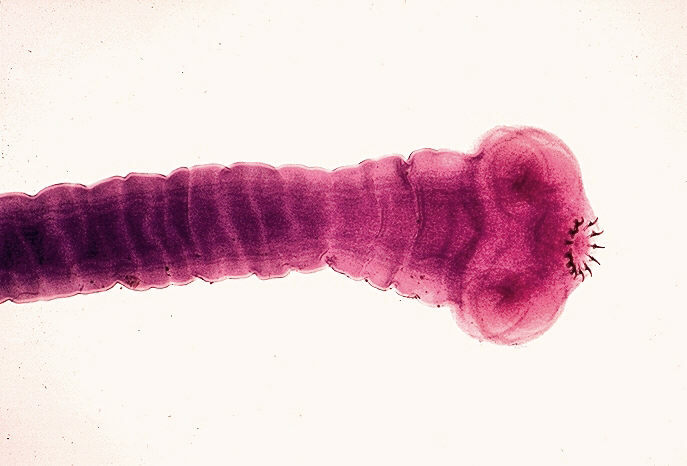 The adult t. solium has a head (scolex) that consists of four suckers and a double crown of hooks, a narrow neck and a large body formed by several hundred proglottids. Taenia solium inhabits the small intestine of humans, where it is attached to the intestinal wall by its suckers and hooks. Everyday some gravid proglottids are detached from the distal end of the worm and are passed with the feces. Each proglottid liberates thousands of fertile eggs which are resistant to environment . The pigs who get in contact with the eggs, once in the intestinal tract lose their coat and liberate embryos ( oncospheres) which cross the intestinal wall and enter the bloodstream, from where they are carried to the tissues and evolve forming larvas (Cysticercus). Human consumption of improperly cooked infected pork results in releas of cysticercis in small intestine where , by the action of digestive enzymes, their scolices evaginate and attached to the intestinal wall. The proglottids begin to multiply and will become mature approximately 4 months after infection. Cysticerci are small vesicles that consist of two parts, the vesicular wall and the scolex. The scolex has an armed rostellum and a rudimentary body. After entering the central nervous system CC are in a vesicular stage in which the parasites have a transparent membrane, a clear vesicular fluid, and a normal invaginated scolex. The first stage of involution of CC is the colloidal stage , the vesicular fluid become turbid, and scolex shows signs of hyaline degeneration. In the second stage the wall of the cyst thickens and scolex is transformed into mineralized granules. Finally the parasites remnants appear as a mineralized nodule ( calcified stage). Some cysticercal antigens stimulate the production of specific antibodies that form the basis for the immunologic diagnosis of cysticercosis, while others play a role in the evasion of the immune surveillance against cysticerci. Recent studies realized using a murin model for NCC observed a defect in myeloid cells activation/maturation in the helminth infected brains . More over , cestode soluble antigens inhibited TLR ligand induced pro inflammatory cytokines production and NFKb activation in vitro. Addictionally, exposure of PL ( parasite ligands) inhibited not only TLR activation induced (LPS exposure), but also non-TLR agonists induced ( thapsigargin exposure) activation of CA signaling pathway. suppressive mechanism to block the initiation of the inflammatory response associated with helminth infections. may remain symptom free. Impaired blood brain barrier allows recruitment of immune cells in the CNS during infection and soluble intercellular adhesion molecule-1 (sICAM-1) plays an important role in the recruitment of immune cells. The study revealed that individuals with variant (EE) genotype were more susceptible to symptomatic NCC and also had an elevated level of sICAM-1. Neurocysticercosis may present with a variety of clinical manifestations, a pleomorphism that is related to individual differences in the number and location of the lesions within the CNS, and to variations in the severity of disease activity. In endemic areas, neurocysticercosis is considered the “great imitator” as it may mimic almost any other neurologic disease. Seizures , focal neurologic signs , cognitive impairment , and intracranial hypertension, are the most common clinical manifestations of neurocysticercosis. Epileptic seizures are the most common clinical manifestation of neurocysticercosis and usually represent the primary manifestation of the disease in up to 70% of patients. Parenchymal neurocysticercosis finding with TC and MRI can show the stage of cysticerci and the grade of perilesional edema. Sub arachnoid neurocysticercosis leads to hydrocephalus caused by inflammatory occlusion of luschka and magendie foramen. Ventricular neurocysticercosis appears on TC as an hypodense region that distorts the ventricular system causing asymmetric obstructive hydrocephalus . Immunologic diagnostic tests are used to assess the prevalence of cysticercosis in populations and to exclude or confirm the diagnosis of neurocysticercosis in neurologic patients with inconclusive neuroimaging findings. The complement fixation test and the enzyme-linked immunosorbent assay ( ELISA) are time-honored tests that have been used for the decades to diagnose cysticercosis. However, both tests have been faced with problems inherent to poor sensitivity or specificity. False-negative results are related to local production of antibodies, in peripheral blood, or to immune tolerance to the parasite without production of anticysticercal antibodies and false-positive results are due to previous contact with the adult t. solium or to cross-reactivity with other helmints. The demonstration that antibodies to species-specific antigens of t. solium can be detected by enzyme-linked immunoelectrotransfer blot ( EITB) assay stimulated investigators to develop highly purified antigens of cysticercus to be used in a new immunologic diagnostic test for cystocercosis. Detection of circulating parasitic antigens using monoclonal antibodies is another immune diagnostic technique; but detection of circulating antigens is possible only in patients with active disease. A single therapeutic approach is not useful in every patient with neurocysticercosis. Characterization of the disease in terms of viability of cysts, degree of the host’s immune response to the parasite, and localization and number of lesions is important for rational therapy. Therapy usually includes a combination of symptomatic and cysticidal drugs. Surgery also has a role in the management of some patients. The drugs actually used are : Praziquantel and Albendazole. The symptomatic therapy should be integrated whith cysticidal drugs. Neurocysticercosis is a patology correlated to the infection of T. solium. There is a lot of variability in clinical manifestation due to individual differences related to alterations in immune response, which allowed the silence progression of patology. Actually the mechanism of action of cestodes in poorly understood, but some new studies try to explain the biological pathway implicated in the down regulation induced by the cestodes in the immunitary human system. Helminth induced suppression of macrophage activation is correlated with inhibition of calcium channel activity. Chauhan A, Sun Y, Pani B, Quenumzangbe F, Sharma J, Singh BB, Mishra BB. Association of ICAM-1 K469E polymorphism with neurocysticercosis. Singh A1, Singh AK1, Singh SK1, Paliwal VK2, Gupta RK3, Prasad KN4.